Much like your typical school romantic comedy love-triangle story, School Rumble is definitely your stereotypical anime that features all the mentioned genres above. If you have watched romantic comedy animes before, School Rumble is definitely your stereotypical compilation of love triangles, misunderstandings, depression, and commitment. The story starts off like no other featuring the main girl in the center of everything, Tsukamoto Tenma, who has fallen in love with her fellow classmate, Karasuma Ooji. Not other that, Tenma's other classmate, Harima Kenji has taken a liking to her, but he is unable to confess his feelings for her. So, like any other story, you will pretty much expect what will go on throughout the entire series. The art was quite good although it was only available in standard definition. However, the character presentation and art style was cute and well illustrated. I must note that the animation was also fluid and contained plenty of dramatic effects for various scenes. I must say that the voice acting suited the characters perfectly from your loud and peppy Tenma to your shy and quiet Yakumo. The theme songs were pretty peppy and quite silly in nature. Although they weren't the best music to my taste, they were catchy in a way that it gets stuck in your head not that you want it to. The anime is all about the characters and their lives. Nothing else matters. You will be constantly fed the fantasies of both Tenma and Kenji as they try to chase their loves of their lives. Along to help them (or get in their way) are a wide range of characters in the classes of 2-C and 2-D of which both classes tend to clash often. Of course though, I couldn't help but feel sorry for Harima Kenji a lot throughout the anime as he is always misunderstood, rejected and alone. Overall, it was a quite a good anime to enjoy. I was slightly disappointed that the anime did not end after 26 episodes of pretty much naiveness and misfortunes. I felt that it may have been too long of a story to follow and I really wanted a resolution to come quickly. However, the story does not end there and you are left to continue on past the fillers and into the sequel. 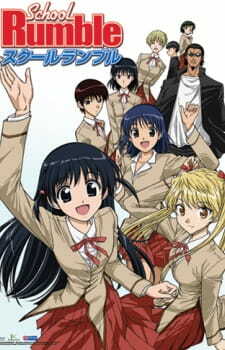 I expected it to be like any other typical romantic comedy anime and School Rumble certainly proved that to be true. Nothing groundbreaking here. It was well done from the character design to the sceneries. Voice acting suited the characters perfectly, the theme songs were decently catchy. Harima Kenji took a little while to get used to because of his looks, and Karasuma just felt so boring to watch. Other than that, the plentiful of girls in this anime were quite appealing. The anime slowly build on you, and somewhere along the line, you get interested at what will happen next. It was enjoyable to watch and to get involved in. The anime however leans more to the comedy side than the seriousness of love which is a shame because I quite liked the character representations. Last month, Steve Jobs returned in a parody of the iPhone 5, which some people found a little close to crossing the line, but most people just found funny. Now, Steve Jobs returns… again. This time it’s for an iPad Mini parody.